The Guilford Press, 9781462522385, 438pp. Christopher Willard, PsyD, is a clinical psychologist and educational consultant with a specialty in mindfulness. Based in Boston, he speaks on the topic of mindfulness and meditation with young people nationally and internationally, and teaches at Harvard Medical School. Dr. Willard is on the board of directors of the Institute for Meditation and Psychotherapy and is President of the Mindfulness in Education Network. He has been practicing sitting meditation since 1999. 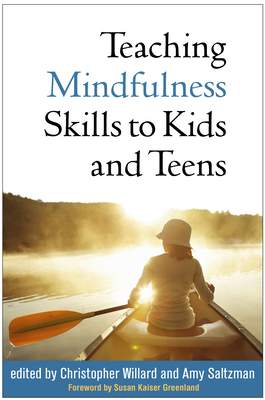 He is coauthor of The Mindfulness Matters Program for Children and Adolescents: Strategies, Activities, and Techniques for Therapists and Teachers and coeditor of Teaching Mindfulness Skills to Kids and Teens, among other books. His website is www.drchristopherwillard.com. Amy Saltzman, MD, is a holistic physician and mindfulness coach whose passion is supporting people of all ages in enhancing their well-being and discovering the Still Quiet Place within. She is recognized by her peers as a visionary and pioneer in the fields of holistic medicine and mindfulness for youth, and her current work focuses on sharing mindfulness with school-age youth in socioeconomically diverse school and community settings. In collaboration with the Department of Psychology at Stanford University, she has conducted two research studies evaluating the benefits of teaching mindfulness to child–parent pairs and to children in low-income elementary schools. To support others in discovering the joy and peace of the Still Quiet Place, Dr. Saltzman has written the book A Still Quiet Place: A Mindfulness Program for Teaching Children and Adolescents to Ease Stress and Difficult Emotions and created two CDs, Still Quiet Place: Mindfulness for Young Children and Still Quiet Place: Mindfulness for Teens. Her website is www.stillquietplace.com.